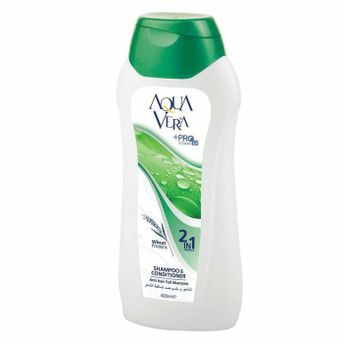 Aqua Vera 2 in1 Shampoo For Anti Hair fall cleanses hair, makes your hair easier to comb and preserves the scalp's normal balance. The rich Pro-Vitamin formula intensely hydrates and restores to leave hair noticeably softer and smoother. Formulated with wheat protein and blended with soothing and moisturizing agents to prevent static electricity, protect from UV rays and thermal effects.